Snacking and choosing wisely can often be tricky. However, pistachios are a healthy alternative and a rich source of energy with plenty of nutrients, minerals, antioxidants, and vitamins. 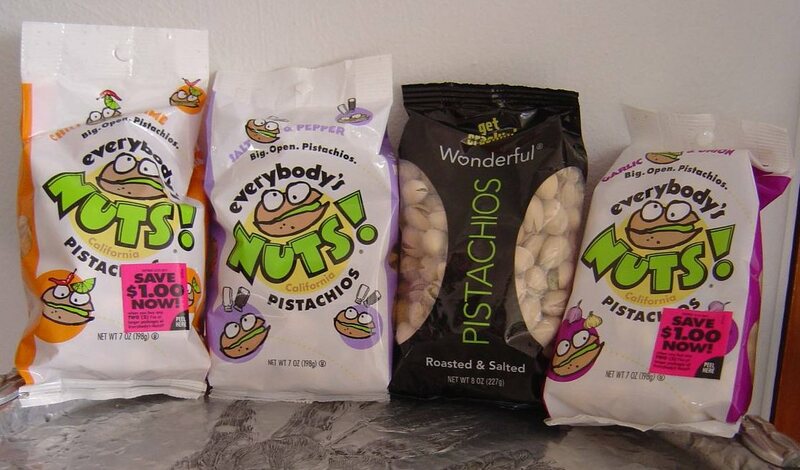 So I was pleased when Wonderful Pistachios sent me four different varieties of their nuts for this yummy review. My family and I got to try the Garlic & Onion, Chili & Lime, Salt & Pepper and the Roasted & Salted varieties from Wonderful Pistachios. Though they all tasted delicious, I preferred the simply Roasted & Salted while my guy claimed the Garlic & Onion, the rest of my troop munched happily away on Salt & Pepper and Chili & Lime. I liked how eager the family took to eating flavored pistachios over less than perfect snack alternatives such as greasy chips or a high-fat content sugary treat. Choosing these more filling nuts with their rich source of monounsaturated fatty acids like oleic acid can even help you lower your bad cholesterol and increase your good cholesterol levels unlike empty calorie snacks. Furthermore, you’ll feel good knowing what a rich source of Vitamin E, B-complex, carotenes, and minerals such as copper and iron that you’re serving. Your family will simply think they are eating anything other than a health food. All it takes a day for these amazing health benefits and even to keep your skin soft and supple is to eat a mere handful of pistachios! I really enjoyed these pistachios and found them satisfying and very good! So the next time, you want to change their less than perfect snacking habit, I suggest trying some of these Wonderful Pistachios. Next Post How to Avoid Being Stung by Banking Fees! i want to tyr the roasted lightly salted. I want Roasted Lightly Salted With half the sodium of our classic salted pistachios, you can now enjoy the same rich roasted flavor with a lighter salt taste. I learned that pistachios are a good source of fiber. I like the Roasted with no salt.They all sound so delicious. I'd like to try the roasted lightly salted. Pistachios are an excellent source of copper and manganese, and a good source of phosphorus. They’re also an excellent source of vitamin B6, offering 20% of the Daily Value per serving. In addition to vitamin B6, pistachios are a good source of thiamin (15% DV) and have lesser amounts of other B vitamins, such as folate and biotin at 4% DV, and riboflavin, niacin, and pantothenic acid at 2% DV.